Steve Martin's fourteenth time hosting. Maya Rudolph's first episode back from maternity leave. Paula Pell's return to the writing staff after her sitcom "Thick and Thin" is not picked up. Sketches include: The Sabotage of Baldwin: An SNL Digital Short, Steve Martin Monologue, Commercial Parody: A Teddy Bear Holding A Heart, Oprah with Stone Freeman, Don't Buy Stuff You Cannot Afford, Hamas Victory Party, Close Talkers: An SNL Digital Short, Quick Zoom Theater, Weekend Update, Superbowl XL Rehersals, Lorne's Office, The Prince Show, State of the Galaxy 2145, Tangent: An SNL Digital Short, Surfers. Prince performs "A Woman Scorned" and "Beautiful Love (3121)" (featuring Tamar). One of the best episodes in recent memory!! 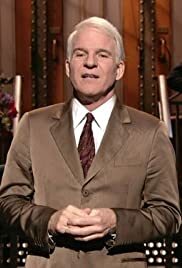 The combination of host Steve Martin and musical guest Prince provided a double whammy to the solar plexus of mediocrity in American sketch comedy. Mr. Martin, appearing as SNL host for a record 14th time, segued into the monologue after a brilliant pre-recorded opening sequence featuring Kelly Ripa and Alec Baldwin, unifying both pieces with his purported use of Viagra. Maya Rudolph appeared next as Oprah, fresh from her distasteful experience with author James Frey, facing Steve Martin as yet another deceitful author named Stone Freeman. Stone answered some hard questions from Oprah with some of the most hilarious backtracking and sidestepping evasions ever conceived. Another funny sketch found Steve playing himself, being duped into appearing at the victory celebration for Hamas. SNL also took a big chance on lampooning Prince during a show where he was the musical guest in what turned out to be one of the weaker segments of the evening. My main complaint would be that Horatio Sanz was under utilized in this episode. All things considered, Steve Martin proved once again that he is one of the most versatile and engaging comedians working today.